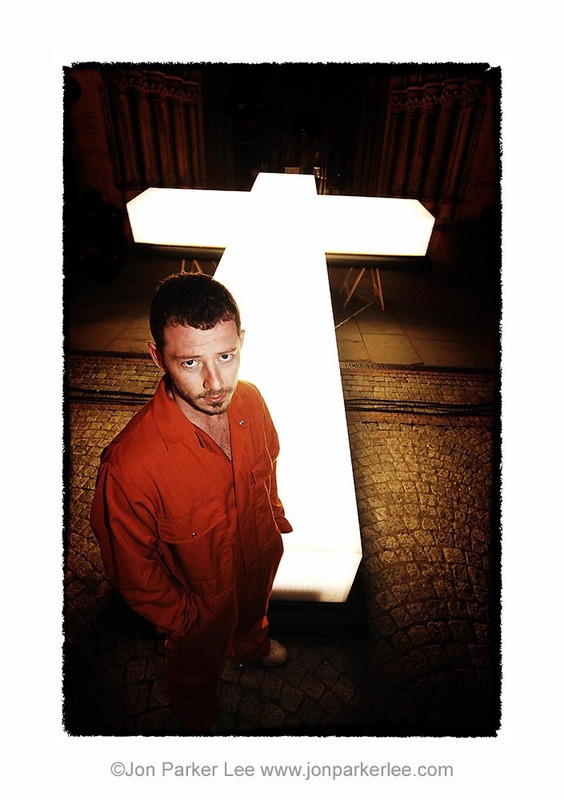 Jon Parker-Lee has been active as a photographer in Manchester since 1993. An exhibition in November/December 2013 at the basement venue 2022 in Manchester’s Northern Quarter celebrated his 20 years in the photography business. I attended the opening night and was very impressed with the variety, style and high technical quality of the photographs. He told me he had picked them at random using a pin, but to me these photos look like they have been carefully chosen. I’ve singled out ten of them and I’ve written something about each one. Hopefully this will inspire photography students to learn from Jon’s work and to go out, experiment and develop a style of their own. 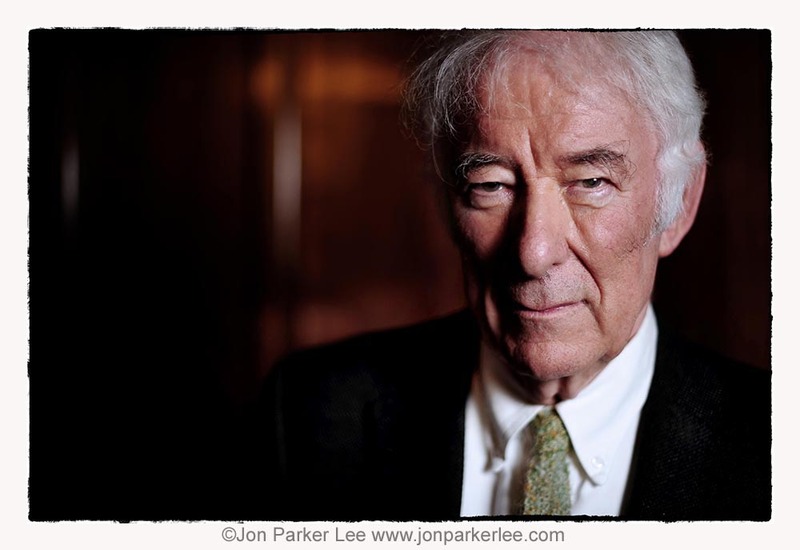 As I often say ‘try to capture the intrinsic quality of the subject’ and the here, the portrait of the late Seamus Heaney seems to do just that. The poet stares with narrow eyes into the camera, white haired and dressed in a suit and tie. He has gravitas, and the photo reflects that, with its dramatic lighting from the upper right, casting deep shadows. Attention is concentrated on the face by the use of a wide aperture – the camera was set to f/1.4 – throwing the background out of focus. The wide aperture is probably essential as the light is low, and the background is almost, but not quite black. It’s just a series of blurred shapes that could be a wall or a wooden cabinet. The setting is Manchester University. A similar attitude towards space can be seen in the portrait of the author Martin Amis. He stands on the left with a serious expression, set against a striped wooden background. The light is coming from the right, casting deep shadows to the left. The picture is not very sharp. The aperture was f/1.4. Only the eyes are in focus. As no flash was used, there are no catch lights in the eyes, giving an enigmatic quality. 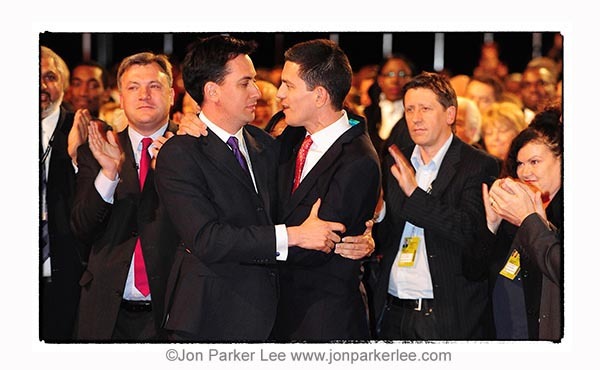 The photo of the Miliband brothers at the Labour Party conference was taken under difficult circumstances. This was just after the moment when he was voted party leader. The photographer had to act quickly in order to be in the right position to get the shot. There was no time for composition or lighting but the photo still catches something very important. The hands seem more expressive than the faces. To capture an image like this you have to be able to move quickly and you must be on top of the technical side of photography. The aperture was f/4 and shutter speed 1/80th of a second. To record the essence of the subject you often have to capture the essence of their working environment. Jon photographed music stars Amadou and Mariam at the New Century Hall before their Concert in the Dark at the Manchester International Festival in 2009. Jon has depicted them small in the frame, placed against an almost totally black background. Only a small amount of light shines on them. They are both wearing dark glasses, and most of the picture is black. A paparazzi style photo taken outside the venue with a flash would not have captured the essence of the subject, as this image does. 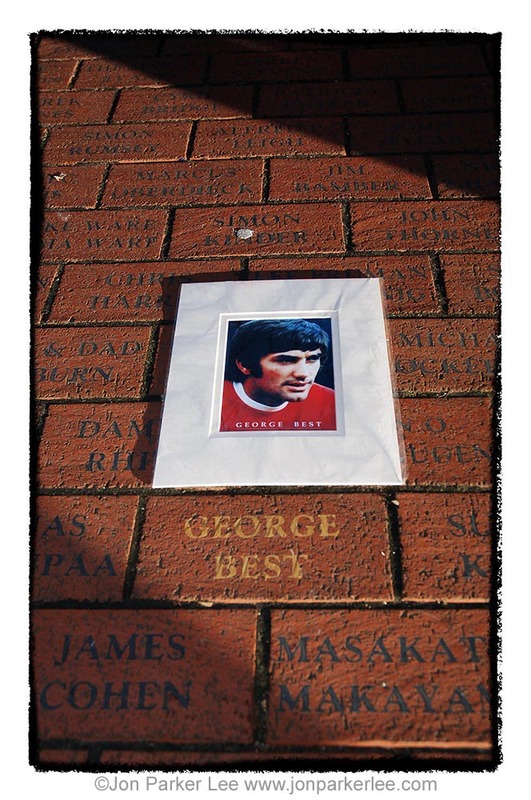 The George Best tribute image from 2005 shows the potential of ‘a photo within the photo’ but what really gives the image a lot of power is the use of diagonal shadows at the top and the bottom. The piece of chewing gum – or is it a squashed piece of Blu-Tack – is in keeping with the improvised nature of the subject. I’ve picked out the photo of Gill Wright, project manager at Victoria Baths, because I know her. e setting is actually quite untypical of the Baths, as the changing cabins don’t normally look like this. A single light is set up inside a cubicle in the main pool. Gill sits inside, maybe a little self-consciously, with a smile on her face. She is very slightly off centre which could be said to break the rules of composition. Actually they are not rules, they’re guidelines. Overall, the image works well. I love the photo of road markings on the Mancunian Way from 2004. This is the closest subject matter to mine. The viewpoint is from above, making the road look like a wall and turning the letters into graffiti lit up by the orange street lamps. The line on the right looks like an exclamation mark without the dot. Without doubt, a strong statement about Manchester. The vigil to remember the victims of the Chernobyl nuclear disaster is lit by just a few candles and little else. John has managed to achieve a picture that is sharp and without any blur due to movement. There is just the right amount of lighting on the faces of the three people in the foreground, including Neville Ball and Betty Tebbs. In terms of composition, they make three points of a triangle. Betty Tebbs, who is wearing the anti-nuclear necklace, is the central focus of the image. A point-and-shoot photographer would probably have just used flash. This photograph shows why you often have to use available light to capture the true essence of a scene. It is not easy to achieve, but Jon has managed it here. So those are my thoughts. If you’re serious about photography there is no substitute for going along to an exhibition and studying top quality framed prints by a skilled, experienced and imaginative photographer – like Jon Parker-Lee! The exhibition finished in early December 2013, but you can keep up to date with Jon Parker Lee by going to his website www.jonparkerlee.com. @AidanEyewitness Thanks Aidan. Great photos enhanced by really interesting comments.